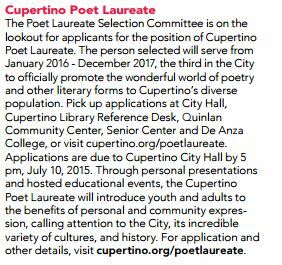 Click through here for the announcement on the Cupertino Library Foundation’s website. The selection process was frequently advertised in local papers, the Cupertino Scene and the Courier. The Mercury News/Cupertino Courier also placed our advert. Media Poetry Studio Fabulous Finale!